Newcomer Family Obituaries - Nicholas C. 'Nick' Fendley - Newcomer Cremations, Funerals & Receptions. 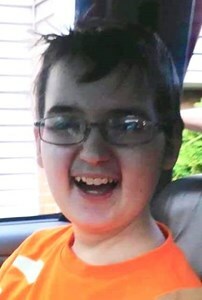 Nicholas Cole Fendley, age 13, of Toledo, passed away peacefully Monday, February 4, 2019 with his loving family by his side at Hospice of Northwest Ohio, Perrysburg. He was born on April 13, 2005 to Patricia Fendley and John Eichner in Toledo. Nick was a very charismatic kid who loved Captain America, Minecraft and building things. He enjoyed hockey, cars and Nascar. Nick liked doing puzzles and spending time with his family. He will be deeply missed by all whose hearts he touched, and remembered for his smile and love that he shared. Nick is survived by his loving mom, Patricia “Trish” (Jeremy) Goldthwaite; dad, John (Amber) Eichner; siblings, Zachary, Michael, Constance, Elistasia, Victoria, Kailee, and Sasha; PawPaw, James A. Fendley; grandma, Robin (Kurt) Zubke; great-grandma, Leah Fager; aunts, Paula “Booga” and Pamela Fendley, Ellen Mahlman and Jennifer Miller; uncle, James Fendley; cousins, James and Taylor Fendley; and many other family members and dear friends. He was preceded in death by his great-grandma, Bertha Spinks, who always looked at Nick as her “Lil General” and they had an unbreakable bond; also his grandpa, John Fager. The family will receive guests on Sunday, February 10, 2019 from 2 – 8:00 p.m. at Newcomer – Southwest Chapel, 4752 Heatherdowns Blvd., Toledo (419-381-1900). Funeral Services will begin Monday, February 11, 2019 at 10:30 a.m. in the funeral home. Interment will follow in Historic Woodlawn Cemetery. The family would like to give a special thank you to the staff and caregivers at the Toledo Children’s Hospital, Oncology Dept. especially Jenny, Laura, Ruth, Pam and especially Tabitha for all of their love, care and support given to Nick and our family through this difficult time. We would also like to thank Tiana’s Wish, Make-a-Wish, Child Life, and Launching Larry for one hell of a ride. To share a memory of Nick or to leave a special message for his family, please click the "Share Memories" tab above. Add your memories to the guest book of Nicholas Fendley. When i was a teenager i was asked to baby sit by trisha . I met trisha through tiffany and kari . i went to trisha house where i was watching the kids and that night i had a bad head ache. After i thought all the kids went to sleep i layed on the couch and i was awaken by nick as he layed next to me and tucked his lil head under my chin and put his arm around me the best he could. He was so sleepy. He was very small. I rember thinking this is the nicest lil kid i ever baby sat for . he was a baby at the time. And he was never hard to handle. He was very spirited in the short time i was around him. My mom moved me to another state and i have not seen lil nick since then but im so so sorry trisha. I know u love ur babys and ur one hell of a mother. Im so sorry this happened. Nick loves u and he will now be ur angel and watch over all of u . I love u and ill keep u all in my prayers. But every time i think of nick i think of that night. He was and is so sweet. Love u all. Prayers for nicks family and friends during this difficult time. I pray you find peace and understanding. Im sure nick is flying high with angels. I didnt know him or his family but read his mothers comment on a video about her loosing nick. I had to spread my love to you all. During this difficult time, may Jesus our God of comfort embrace you all with His loving arms as you remember Nick's life. peacewithGod.net has been a source of hope & inspiration and we thoughtfully share. "To be absent from the body is to be present with the Lord". Nick was a great kid! I enjoyed having him in kids church with me. Often I would tell jokes and nobody else would laugh, but Nick always laughed at my jokes. Nick you will be missed. Sympathy to your family from Deb Wolke. I knew Nick when he was a student at Winterfield. I had the good fortune to know Nick and work with him during that time. I hope your trip to Disney World was a wonderful memory.